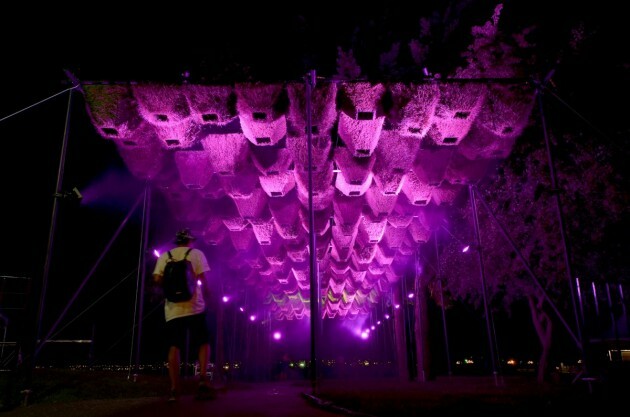 Matthew Soules Architecture (MSA) have designed Vermilion Sands, a living canopy made up of 260 pyramidal forms that have been hydro-seeded and grown in a nursery before being hung from a tensile grid. 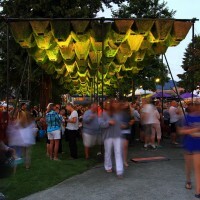 Vermilion Sands was created for the West Vancouver Museum in West Vancouver, Canada. 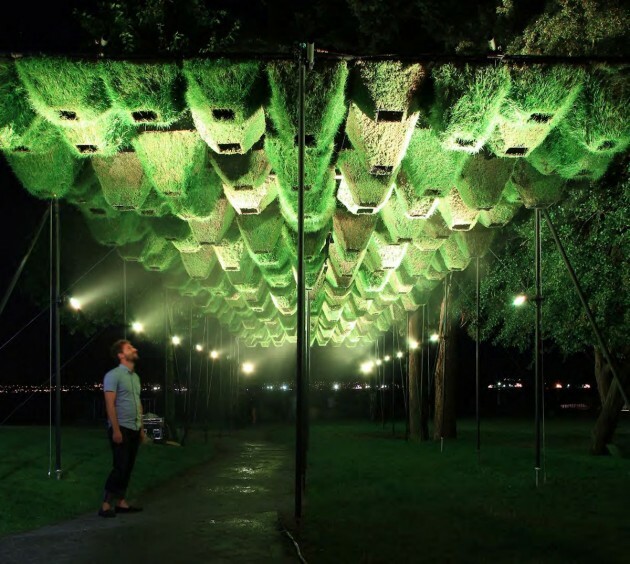 Vermilion Sands, designed by Matthew Soules Architecture (MSA), is a temporary canopy structure that shapes living plants into a three-dimensional pattern and explores the relationship between the natural and the artificial. 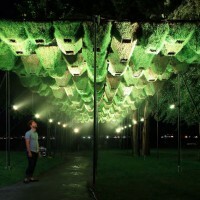 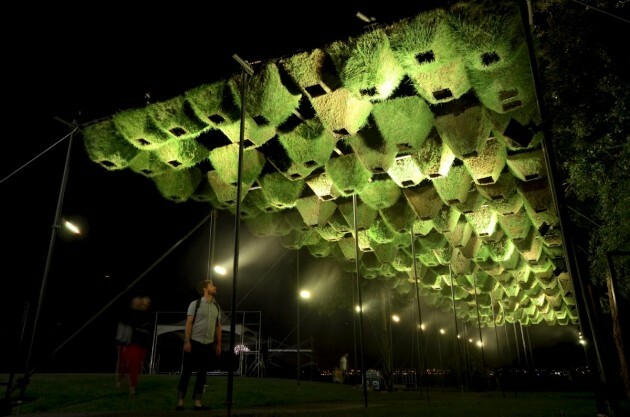 The canopy is comprised of 260 custom-fabricated modules, each hydro-seeded with either white clover or perennial grass, that were grown in a nursery, and then suspended from a fine grid of aircraft cable. 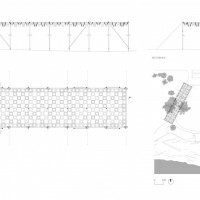 Pursuing this unprecedented methodology, the result is an axial roof structure that is abstract and pure while also being heterogeneous and biotic. 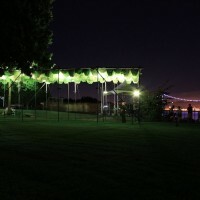 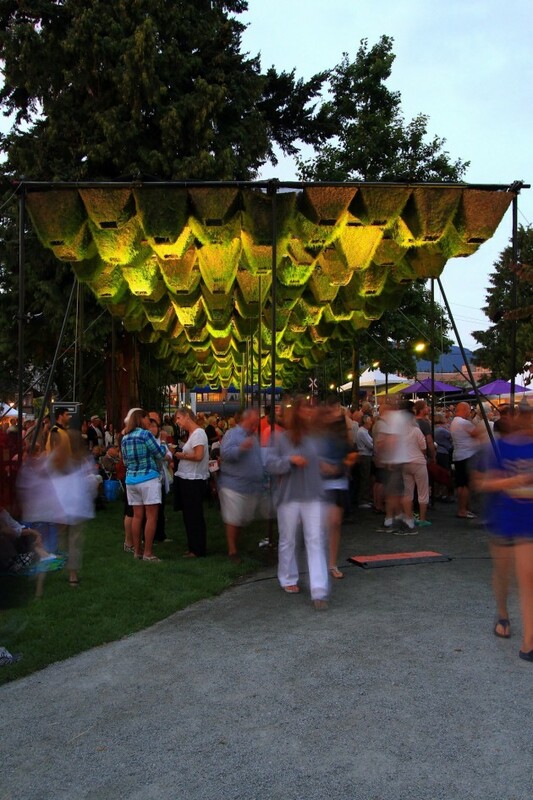 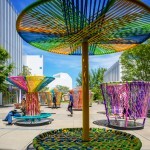 Constructed for the Harmony Arts Festival, under the curatorship of the Museum of West Vancouver, the canopy provides both a loggia-like entry to the festival grounds and shade from the summer sun. 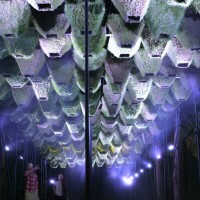 An integrated misting system hydrates plant-life while enhancing cooling, and in combination with LEDs positioned on each perimeter column, produced a gauzy, dream-like atmosphere. 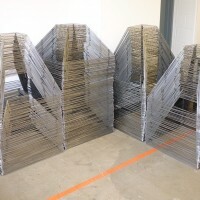 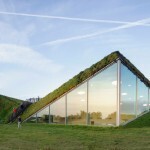 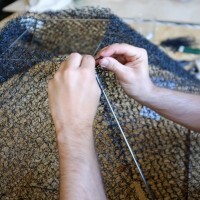 Each pyramid-shaped module is made from a steel wire frame upon which a geotextile fabric is sewn. 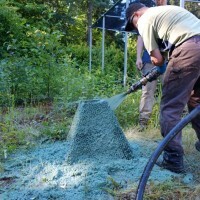 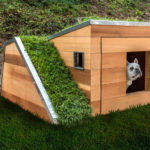 The modules are then hydro-seeded, a process in which a slurry mixture of wood pulp, guar gum (a biodegradable adhesive), and seeds is sprayed onto the geotextile. 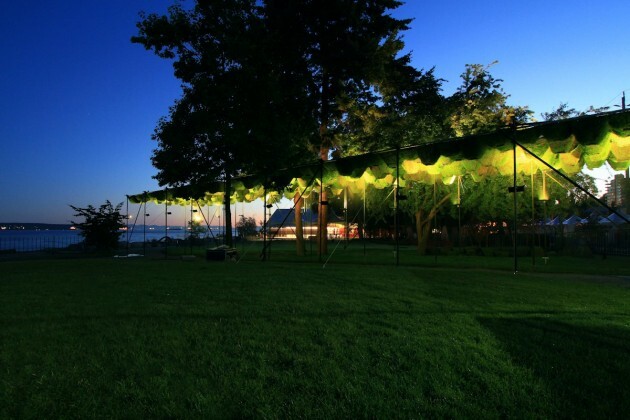 The subsequent growth results in a rich and varied surface that transforms over the life of the installation. 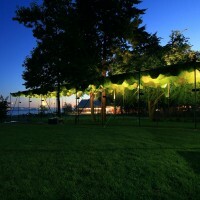 The canopy is strategically threaded through a stand of trees on the site. 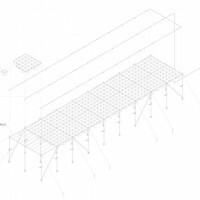 This position achieves diverse environmental conditions across the length of the canopy – with some areas more exposed than others. 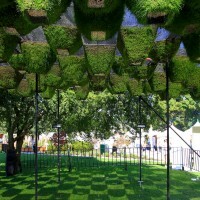 This range in conditions is registered in the different ways that the plants respond, with some areas growing more than others, allowing an emergent and context-specific result. 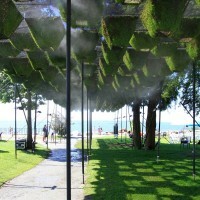 The project derives its name from the title of a 1971 collection of short stories by JG Ballard. 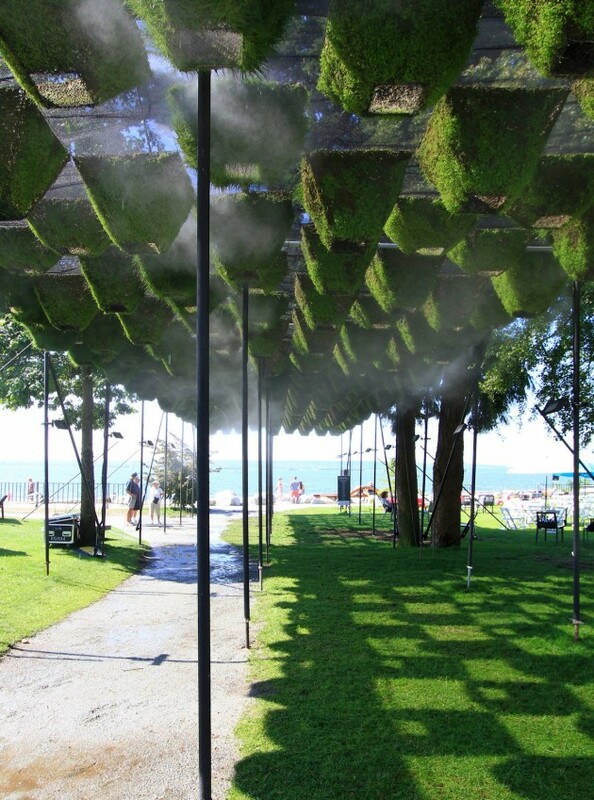 In this collection of sci-fi tales, each story focuses on a particular design or artistic medium in which nature is hybridized with technology to produce surreal and baroque results – for example, singing plants, living fashion, and cloud sculptures. 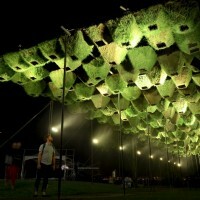 Within the context of the Anthropocene we currently inhabit, where the ability to disentangle the ‘natural’ from the ‘artificial’ is fleeting; it appears that the aesthetics and sociality of the future will be increasingly populated with the splendorous designs in Ballard’s prescience texts. 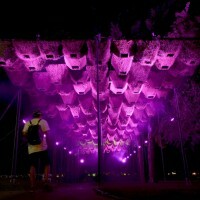 It is our fantasy that Vermilion Sands the canopy could be a character within Vermilion Sands the book.